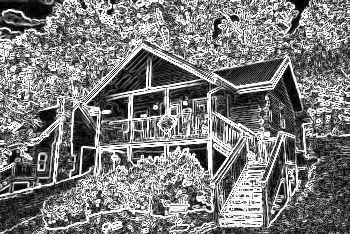 Book one of our cabin duplexes in Pigeon Forge TN online for your immediate Online Cabin Discount year-round! Cabins USA selected several of the finest cabins in Pigeon Forge for your family or group to enjoy while visiting the Tennessee Smoky Mountains. Our duplex cabins, shown here, are located next to Dollywood Theme Park and the main attractions in Pigeon Forge. One of our duplex cabins in Pigeon Forge is perfect for the family traveling with an infant, there's a baby crib and high chair already available so as to lighten your vacation load. Action packed Pigeon Forge offers dozens of attractions, dinner shows, thrill rides and more for the entire family, toddlers to seniors there something for everyone to enjoy in the South East's biggest playground. Nearby Gatlinburg also offers some shows and is host to Ober Gatlinburg Ski Resort with an indoor ice skating rink, shopping, eateries and year-round activities. Visiting Wears Valley is a must for guests wanting to travel through one of the Smoky Mountains most scenic drives and visit some of the most unique roadside mom-pop shops. Don't forget to book one of our duplex cabins in Pigeon Forge TN online to get your Cabin Discount. Before planning your stay in the Tennessee Smoky Mountains, check our Pigeon Forge Events Calendar for scheduled events throughout the Tennessee Smokies! Come experience "Dainty's Digs," a 2 bedroom cabin duplex located in Golfview Resort in Pigeon Forge that boasts indoor & outdoor pool access, a hot tub, and more! Experience "A Tennessee Twilight," Pigeon Forge cabin rental with outdoors and indoor resort swimming pool! Stay only 2 miles from Downtown Pigeon Forge!